When is a long-term indigenous resident not a citizen, a recent new arrival not an immigrant, and a newly arrived immigrant an automatic citizen? what’s the difference between a new arrival and a foreign worker, an illegal immigrant and an infiltrator? Just who gets counted by whom in officialdom in Israel, and who doesn’t get counted at all? Put bluntly, who is made invisible by whom? It’s complicated – or is it? All Jews living outside of Israel are entitled by virtue of being Jewish to emigrate to Israel and become Israeli citizens. Jewish immigrants to Israel are known as olim (the Hebrew word olim can be translated as ‘going up’); the journey is known as ‘making aliyah’. Non-Jewish (documented) economic immigrants to Israel are primarily known as ‘foreign workers’. The municipality of Tel Aviv-Yafo on its official website devotes its entire ‘new residents’ page to the olim only; ‘foreign workers’ are not mentioned. It’s not only the Tel Aviv municipality that appears to make ‘foreign workers’ invisible; the Israeli census doesn’t count them at all. with the exception of the Palestinian municipal residents of annexed east Jerusalem, and the primarily Druze residents of occupied Golan heights, the Israeli census does not count non-citizens of Israel in its once-in-a-decade headcount. Perhaps not surprisingly, the exact number of ‘foreign workers’ residing in Israel would appear to be unknown. Part of the uncertainty derives from the fact that a significant number of previously authorised workers have outstayed their work permits and remain in the country illegally, many of whom are assumed to be working without official permits. In addition, a significant number of people who entered the county legally on short tourist visas, but have outstayed those visas, are also assumed to be working without permits. These numbers do not include the tens of thousands of African residents who entered the country illegally, a significant proportion who now claim asylum-seeker status. most of these immigrants came across the largely unprotected Sinai border. undocumented African migrants who entered the country without a permit and who may be eligible for refugee status are often called ‘infiltrators’ in the mainstream Israeli press. To complicate matters, non-governmental organisations (NGO’s) who work closely with both documented and undocumented immigrants often categorise or classify these various immigrant groups differently, with some grouping all foreign workers, documented and undocumented, together. The Centre for immigration and migration Israel (Cimi) states there are 77,000 legal foreign workers, 16,000 illegal and a further 91,000 who have outstayed their tourist visas. The African refugee development Center (ardC) also says there are 77,000 foreign workers who have valid work permits. in addition, ardC reports that there are 46,000 un- documented African immigrants who have entered the county illegally.4 a 2013 report on the news website ynet claims that there are 109,000 legal foreign workers and a further 93,000 who are undocumented.5 The same ynet report stated the number of undocumented African immigrants at 54,000. other sources suggest up to 59,000, with an estimate of 17,000 living in south Tel Aviv. From this information we have generated a Tel Aviv map that includes both foreign workers (documented and undocumented) and those African immigrants who have entered the country without a permit many of whom seek asylum status. we estimate the total combined figure for these groups is 40,000. That’s just under 10% of the total population of Tel Aviv. We call the map the ‘missing Persons of “Postcards from Tel Aviv”. 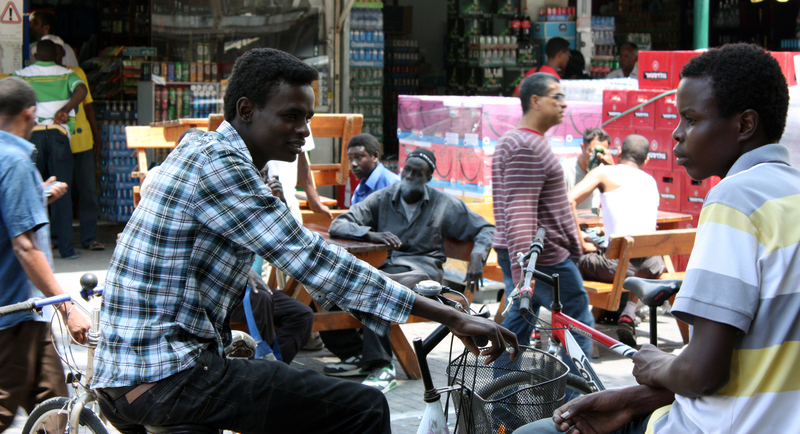 Tel Aviv is a hugely diverse city, with immigrants, both Jewish and non-Jewish, coming from all parts of the world. in addition to the 10% who are not counted, most of whom were born outside of Israel, 27% of the Tel Avivian Jewish population were born abroad. This works out at around 33% foreign-born in Tel Aviv-Yafo. The foreign-born population of New York City is 37%. It is that diversity that contributes to the social and cultural dynamism of the city. ’Mapping the Missing Persons of “Postcards from Tel Aviv’’’ is a call to both the Israeli census and Tel Aviv municipality that all the residents of Tel Aviv, irrespective of their religion, origin, legal status or citizenship, should be counted. Planning ahead for adequate social and housing provision in any city is a challenge. in a city where 10% of its residents are not even counted, it makes planning those services all the more difficult, but this is not simply about efficient planning. A decision not to count all residents – many of whom may have lived legally for years in the city – not only makes these residents invisible, it sends a clear ‘official’ message from the ‘City’ and ‘State’ on the values and importance of social integration. Next How Volatile are the Israeli Voters?